Hiring in September reaffirmed that job creation is moderating from the elevated levels of the past two years. The downshift to a more tempered pace likely reflects a shortage of qualified workers as unemployment hovers near 5.0 percent. 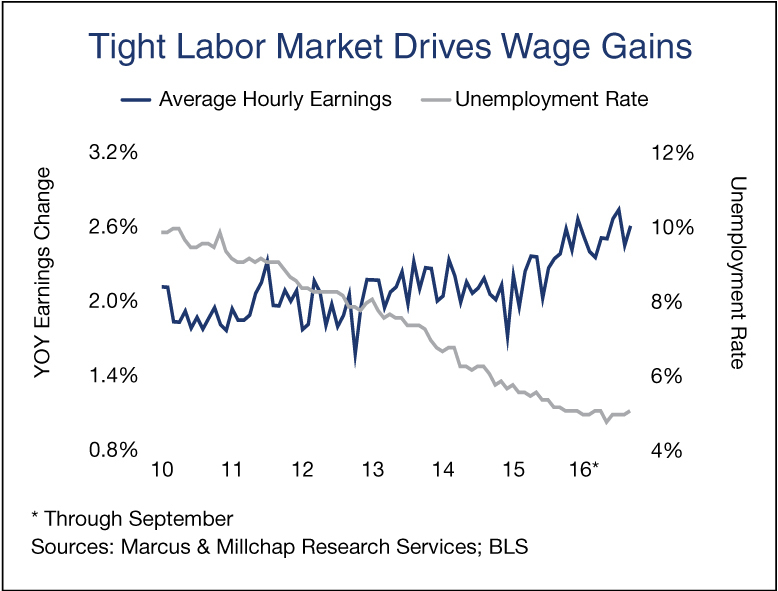 Accelerated wage gains offer some evidence that employers are competing vigorously to fill positions, an action that could intensify inflation pressures in the coming year. The addition of 156,000 jobs last month fell somewhat short of expectations, although a broad range of industries expanded payrolls. Healthcare providers contributed 22,000 positions to the total, and have created 3.9 million positions over the past 10 years. The enrollment of new workers in employee-sponsored coverage and an aging population will generate new positions in the near term, generating demand for medical office space. Another sector of note is natural resources and mining, which stabilized following a string of 23 consecutive months of cuts. Employment in the oil and gas industry appears to have balanced as oil prices have staged a modest rally. Approximately 5.9 million jobs remain open, the highest level on record. Translating openings to actual positions remains somewhat challenging, however, indicating difficulties matching candidates’ skillsets with job requirements. With the unemployment rate at 5 percent and the under-employment rate under 10 percent, a thinning pool of prospective workers will exert upward pressure on wages as employers intensify competition for workers. During the past 12 months, average hourly earnings rose 2.6 percent. Job growth and the tight labor market are spurring household formation and maintaining U.S. apartment vacancy at seldom-seen levels. In the third quarter this year, vacancy retreated 30 basis points to 3.5 percent despite a substantial wave of new rental stock. Approximately 100,000 rentals remain under construction with delivery dates in the fourth quarter, which will likely bump vacancy 30 basis points higher by the end of the year. Additional hiring and wage growth will support increased spending on retail goods in the coming months, particularly as the holiday season approaches. Core retail sales, or receipts excluding automobiles and gasoline, have been growing at a pace in alignment with the long-term average of 4 percent annually. Online sales are capturing an increased share of general merchandise sales, but many retail centers are realigning their tenant profiles to favor restaurants and services. The combination of restrained construction and growing demand has pressured national retail vacancy to the lowest level since 2006, with additional tightening expected to lower the vacancy rate to 5.6 percent by year-end. This entry was written by marcusmillichap, posted on October 10, 2016 at 8:00 pm, filed under Commercial Real Estate, Research, Uncategorized and tagged Economy, Employment, Marcus and Millichap. Bookmark the permalink. Follow any comments here with the RSS feed for this post. Comments are closed, but you can leave a trackback: Trackback URL.